This project is about human interaction and conscious choices. The Love Bead Safe Harbor Pin Project: Given the chance, would people consciously and publicly choose to commit to treating other people — all people — with respect? 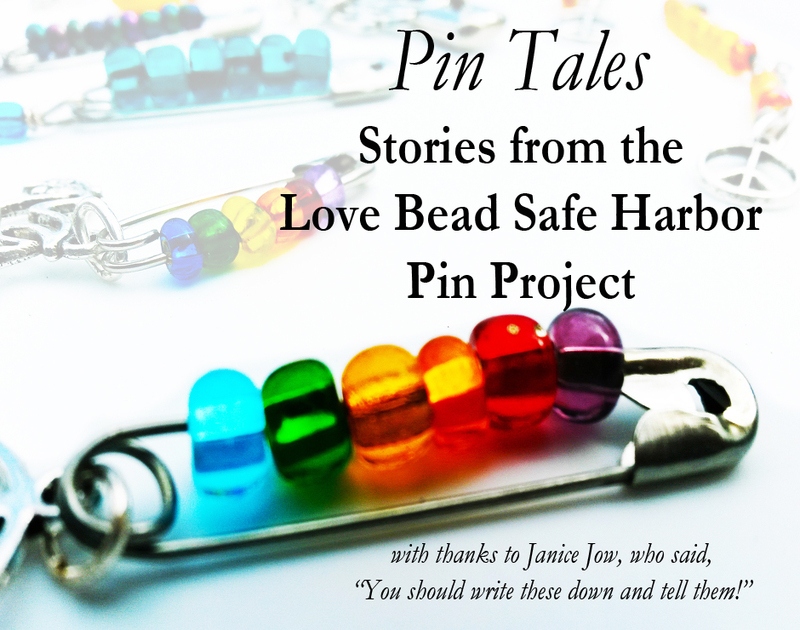 In 2016, we began a project that became the Love Bead Safe Harbor Pin Project. The idea was simple. Given the opportunity, would people make a public commitment to try to treat other people with respect? To start the conversation, we made “Safe Harbor” pins (safety pins worn to show your commitment to treating all people with respect), hand-beading them to turn them into “Love Bead Safe Harbor Pins,” and gave them away, free. At first, the idea was simply to offer encouragement to people who might be feeling rejected or unwanted in a political climate that has been increasingly aggressive, judgemental and polarized on every side. We had wonderful interactions with people, conversations that started when they admired the pins we were wearing and were offered pins of their own. It was interesting, how people engaged with us or reacted to the Safe Harbor pins we were wearing. Most reactions were positive, even in people who didn’t know about the Safe Harbor movement (which has been most people we’ve met). The pins we made were, well, friendly looking. Shiny, colorful, bearing a peace symbol or other attractive little pendant. Wearing them started conversations we would not otherwise have had, about the current social and political climate, about how people should treat each other. Encouraged to expand the project, we wondered… if you gave a large number of people an opportunity to make a conscious choice to affirm the right of other people, even people they don’t understand, or disagree with, or don’t like, to be treated with respect, would they publicly affirm that conscious choice? Having given away pins in three cities, we can say that based on our experience, yes, they will, most of them. The acceptance rate varies between 75% and 91%. If no, allow person to pass without further engagement. If person declines pin after explanation, thank him/her for time and allow to pass without further engagement. If person accepts pin, thank him/her, explain that there are two pins on the card so that s/he can give one to someone else, and wish him/her a good day/weekend. Only engage in further conversation if the person wishes to. If person offers money, explain again that pin is free and encourage him/her to donate the money to a charity or cause he/she believes in. Always thank person for his/her time. Accept a pin (which now has meaning attached to it via the explanation). The person chooses whether or not to interact with me, and how to interact with me. Will it be a positive experience for us both, or negative? Will s/he listen to the explanation? Will s/he accept a pin, which now has a definite meaning attached? It’s not a huge, ornate, formal ritual. In fact, it’s so subtle that the person may not realize what he or she has chosen to do. Presented with a small keepsake, the person is told that there is a meaning attached to it, and to accepting it. He or she then chooses to accept it, or not. But in that moment, by accepting the pin, the person chooses to accept the meaning of it, that “wearing it, or just keeping it where you can see it” makes a defined statement of a belief regarding how people should be treated. Out of about 600 interactions in three cities, over 550 people accepted pins (in the beginning, most pins were one to a card. Accounting for this, the equivalent of more than 500 sets were accepted, or more than 1,000 pins). Our total for three cities, is that 510 sets of pins (or the equivalent) have been accepted. It remains to be seen how many of the second pins on those cards are distributed, but even if the ripples of this project ended there, that means that over 500 people, given the choice, consciously and publicly affirmed their belief that all human beings should be treated with respect. Who were these people? We’re going to share stories of individual interactions, but in general… they were between six years old (with the permission of the parents) and 87 (volunteered information). They were male, female, people self-identifying as “gender fluid” and many other orientations. They were from many different ethnic, political and religious groups. They were from many different countries. Thanks to the help of a couple of interpreters, they were not all English speakers. They were, in short, a cross-section of humanity. Busy city streets are not good sites for this. We thought that the Haight-Ashbury neighborhood in San Francisco would be the most receptive. It wasn’t. While we did have some wonderful interactions with a few people, easily 90% viewed me as a panhandler (I know this because several muttered that they didn’t have any change as they sped past) and avoided eye contact or any engagement. Many were wearing ear buds, so they never actually heard the explanation — they simply saw a stranger offering them something. Every interaction begins, on the side of the person approached, with a certain amount of wariness and suspicion. Sort of, “Why is this stranger approaching me and talking to me?” The offering of the pin is what changes the dynamic — people become curious. They look at the pin, and while they do, they listen to the explanation. People want positive interactions more than free stuff (although free stuff is a great conversation starter). A friend told me that the pins would be rapidly accepted because “People like free.” To my surprise, that was not why most of the people took pins. They asked intelligent questions about the meaning of the pins, and listened to a further explanation about the significance attached to various color patterns, and chose based on that explanation. In fact, some people said they preferred one color, but chose another based on the meaning attached to it. Because I’m an artist, not a social science researcher, I’m free to say that I found this project hopeful. Most of the interactions I had through it were more than merely “positive.” I’ll get into that in the next post.